The FA-1680 has all the features of the AM-1680, but its own conveyorized system is totally operatorless. It is designed to interface with high volume conveyor-fed systems. The FA-1680 features heavy duty drive belts and electronic eye activation. Cartons feeding down the conveyor are fed into the arch, stopped, strapped and conveyed out, all automatically. Packages can be strapped as many times as required by varying the number of electric eyes. 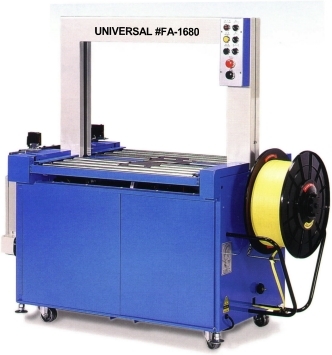 The FA-1680 can be used either manually or automatically. Its dual-tensioning system and strap accumulator make it the ideal machine for high volume users. Strapping Width Available 1/4", 3/8", 1/2"
* This is the standard arch size, and standard conveyor formation. The SDS-1680 is ideal for large carton closure, reinforcing or unitizing heavy products. It avoids the need to raise the carton to a table height. It is perfectly suited for use in dusty environments or with products which leave residue in bottom seal mechanisms. The side sealing design prevents contaminants from entering the machines inner components which reduces costly maintenance and down time. The SDS-1680 can easily be adapted to fit most conveyor systems. With the addition of optional electric eyes it can easily be converted to an operatorless system. The SD-1680 is available in a variety of arch sizes. * This is the standard arch size, other arch sizes available, please ask for details.